This is where America went for the gold. Literally! When gold was discovered on the South Fork of the American River in 1848, it sparked the greatest mass movement of people in the Western Hemisphere igniting our country’s passion to push west for those seeking fortune and adventure. Boaters seek that same thrill today as they parade down Highway 49 with raft topped vans and kayak adorn cars to the rushing waters of the South Fork. During the spring and summer, the South Fork is a playground for whitewater kayakers and rafters of all different levels. The river descends at a steep gradient of 30 feet per mile. The first five miles from the Chili Bar access is chocked full of exciting Class III whitewater with rapids with scary names like Meat-grinder and Trouble Maker. The so-called easy section is the next, nine miles through the valley consisting of a number of Class II rapids including Barking Dog. After that, the river enters what paddlers call “The Gorge.” It’s the most challenging series of Class III rapids descending at 33 feet per mile toward Folsom Lake. In past several years finding water in Northern California has been just about as rare as finding gold, however through deals made with upstream reservoirs and powerhouses along the Federal Energy Regulatory Commission guidelines, timed releases on the South Fork, keep dependable flows of whitewater pouring into the valley during the day, however towards nightfall much like faucet the flow drops till it’s released again the next day. My crew of Manley, Ethan Howard and Kristin Kettehhofen, all young employees of The River Store, the local paddle shop just up the road. They had just closed the store for the night and were now heading out on a sunset paddle with me. Low flow paddles are not the norm on the South Fork, but paddling is paddling I told them and besides, we’ll have the river all to ourselves. About mile down the river makes a sweeping curve to the right and then plunges into two standing waves and hole between as it turns again to left. In high flows river’s velocity, turbulence and converging currents have created a steep hole in its path making it an appealing and challenging site for area play-boaters. In low flows, it produces still an exciting surfing wave for the boys. Local legend says this Class II rapid got its name when a neighborhood dog sprang to the bank barking loudly at the rafters and kayaks as they went down river. Conner and Ethan take turns in their play-boats one after one to test their skills on the churning boil. In a cross between ballet and bull-riding, the boys choreographed the dance of spins, flips and rolls all before the wave spits them out for one more try one more time. Ethan drops the nose of his Dagger play-boat into the turmoil of the Dog, heading straight into its current. Skimming at the edge of the standing wave he dips forward attempting to somersault only to be buried by crashing water. Even in low flows, the Dog can still bite. 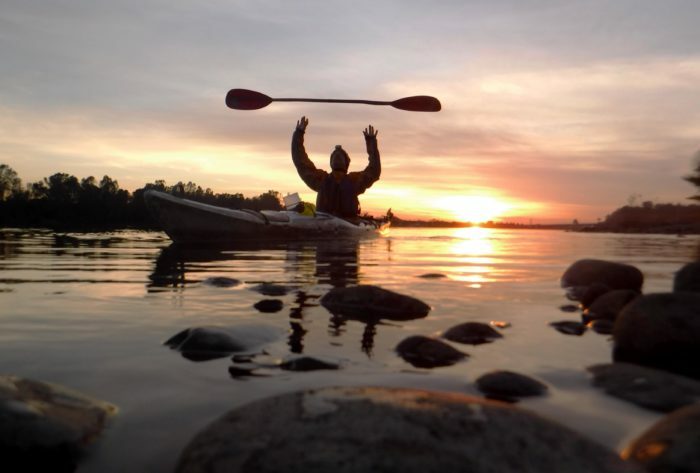 Conner, who is planning next year to attend World Class Kayak Academy, a traveling high school for kayaking students exploring rivers and cultures around the world, is most at home spinning on the wave doing maneuver after maneuver. He loses his momentum after a while, rolling back into depths of the torrent before being spit out on the other side. In high flows, he would have to wait his turn behind the rest of the play-boaters lining up like kids waiting to ride the roller-coaster. Inching forward one by one. It’s a boater’s decorum so to speak, waiting to surf the wave one at a time. He told me that sometimes the wait could be a long one. But on this evening he shares it only with Ethan. We paddle forward toward the Greenwood Creek take out just as the sunset has turned the river into gold.